Curt and I leave for Uganda, Africa on Monday for a 2 week missions trip. We are very excited! Curt is excited because he has wanted me to go since we started dating and I am excited to go because he wants me to go. 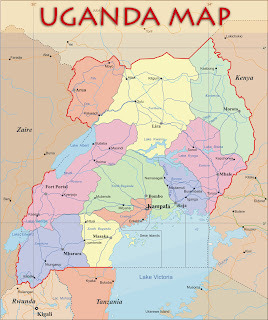 We are going with our Bible Study group of about 20 people and will be staying in the capital city of Kampala. going to schools in the area, etc. We fly from Denver to Minnestoa, Minnesota to Amsterdam, Amsterdam to Entebbe, Uganda. We will be going just under two weeks. So if you think about us, pray that we are safe, all goes well and lots of people are touched by the Lord.